Impact Test Equipment is a leading manufacturer and supplier of laboratory and site testing equipment to civil engineering, construction, mining and aggregate industries, as well as concrete, cement and asphalt manufacturers, geotechnical laboratories, educational and research establishments, government ministries, resellers, engineers and consultants. Impact endeavour to be your one stop location for all your testing requirements. This site utilises a quote cart, similar to the 'shopping baskets' that you may have seen on other sites. When you select an item, you add it to the quote cart, when you've completed your list, you can submit it to Impact to allow our sales team to prepare a full costing of your requirements. Please browse through our range of Test Sets to International Standards - Impact test Equipment has put together a comprehensive collection of Test Sets to International Standards to aid site and laboratory staff in choosing and specifying the equipment and accessories required to perform a specific test. If you can't find a particular test set on this site, please contact us with the details and we will prepare one for you. 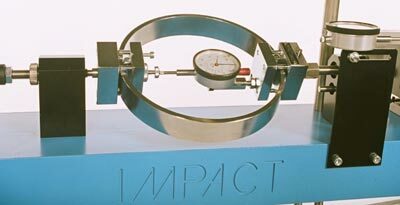 Impact Test Equipment is based in Ayrshire, Scotland and also has a Southern Office in Buckinghamshire, England.